David Robertson is the sort of cartoonist who came around to cartooning with little natural skill but a great deal of desire. His Dump is a gathering ground for short stories he's published in various places, along with several collaborations he's done with other artists. As a writer, he's introspective and fascinated by process and first principles. For example, in his Star Wars pastiche "One Day At Space Wizard Central", he's less interested in the pageantry of their world and more interested in how racism might crop up given that humans die so much quicker than other beings in their order, and how it might be a waste of time to train them. What I like best about it is that there's no particular resolution. "It's Delhi Belly!" is an account of a man who realizes that he has Crohn's Disease and the complications that arise from that. "Sunday" is an hourly comics exercise, where one does a page of autobiographical diary comics once an hour for a whole day. What was interesting about this attempt was how he was able to capture fairly complicated dialogue and get across a sense of what life was like with his wife and two children. "Ps & Qs" cleverly imagines captions for the models at drawing classes. "Berserkotron" and "Dump" continue to follow a character from an older comic as he finds new employment at a factory job that is enormously tedious. There's also a strip about a man being distracted by public bathroom noises as he's deciding whether or not to kill himself and some sillier strips. Robertson's visual style is bland to the point of distraction, especially in his autobio stories. "Dump" at least has some interesting character design in the face of its protagonist Bert, who has pointy, clown-like hair and a pear-shaped face. 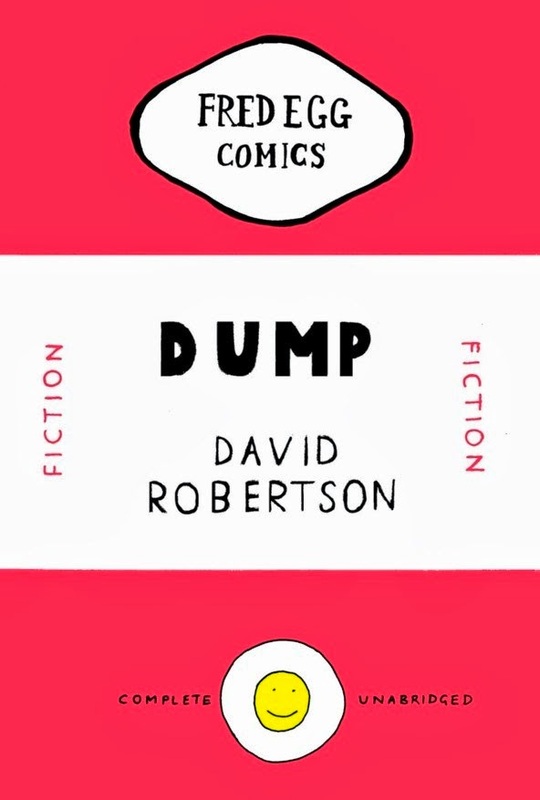 "Dump" is by far the most entertaining of the comics in either issue of Dump the series; it's more imaginative and has a livelier look on a panel-to-panel basis. His "History of E-Mail and the Internet" is little more than illustrated text, with words crowding out images in many of the panels. Ironically, the sloppiness of his 24 hour comic "Everything" gives it a bit of visual flavor. The panels are frequently poorly-drawn and wobbly, and the actual drawings are simplistic and functional at best, but that earnestness that Robertson displays in most of his work really comes to the fore here. It's a history of his entire working life, his ambitions, his failures, his dreams and then finally the way he sort of wound up where he was as both artist and critic. Robertson's voice tends to be careful and measured in a way that sometimes spills over into dullness, but there's an enthusiasm in this strip that's palpable without being twee or overstated. Robertson's analytic nature, which is an asset as a journalist and critic, can sometimes stifle the energy of his comics work. What's clear is that this is a long game for him, as he's interested in experimenting, getting better in public and simply getting work out there. Finding a style, a voice and becoming more technically proficient will all come in time as long as he continues to work. "Dump" is still his most promising work, as it matches that flatness of tone with strange goings-on to create a deadpan atmosphere.